Like whole wheat flour, whole wheat pastry flour too is a whole grain flour meaning that whole wheat-berries are milled to obtain the flour. Unlike its refined counterpart (all-purpose flour), whole wheat flour is not devoid of the bran and germ making it more nutritious. But the question is how is whole wheat pastry flour different from whole wheat flour? The answer is simple. Whole wheat pastry flour is milled from low-protein soft spring wheat, whereas the regular whole wheat flour is milled from hard winter wheat. Softer the wheat, lower the protein content and thus suitable for baking all kinds of pastries including feathery light cookies, muffins, biscuits etc. Hard winter wheat will always be high in protein and hence a suitable choice for bread baking. Like other whole grain flours, whole wheat pastry flour too has a shorter shelf life because of the oil content in the bran. Store whole wheat pastry flour in a cool dry place or preferably in the freezer to avoid getting rancid quickly. Whole wheat pastry flour is also known as Graham flour (in some brands but not always) and soft wheat flour. Cake flour/pastry flour should not be mixed up with whole wheat pastry flour. The former is the white counterpart of whole wheat pastry flour. Why use whole wheat pastry flour? As mentioned above the mellow protein content of this pastry flour makes healthy baking a breeze. Because whole wheat pastry flour is much softer, baked goods made with it will have a similar texture to that of white flour and you can still enjoy the health benefits of whole wheat. In Canada and US, whole wheat pastry flour is available in almost all grocery stores. You should be able to locate it in the baking aisle or natural/organic products aisle if the grocery store has one. The most popular brands are King Arthur’s and Bob’s Red Mill. There are so many other brands out there. As always, US residents can get it online from Amazon and other sites too. Here in Canada, I’m able to get it in bulk too in Bulk Barn. Using regular whole wheat flour in place of whole wheat pastry flour is not a good idea. Because regular whole wheat flour is milled from hard wheat, the flavor and texture is not suitable for baking cookies, muffins, etc. It lends a robust flavor to the baked goods, which is not expected in pastries. So the best substitution will be using a mix of half all-purpose flour and half whole wheat flour. So for instance if a recipe calls for 1 cup of whole wheat pastry flour, you could use 1/2 cup each of all-purpose flour and whole wheat flour. I’m a huge fan of whole wheat pastry flour. So I have a huge collection of whole wheat pastry flour recipes in the blog. Don’t forget to check it out. In India I can’t get wholw wheat pastry flour, so can we use wholw wheat flour as the substitute of wholw wheat pastry flour? You can use a mix of whole wheat flour and all-purpose flour in equal proportions. I also use both Graham flour, and whole wheat pastry flour on a regular basis, and there is definitely a difference. hi.i m from delhi.i m unable to find whole wheat pastry fiour.can u plz suggest some places for buying this pastry floue. thankyou. I’m clueless as to what is available in India or not. You can still use Pillsbury or Ashirwad type of whole wheat flour instead. Is WWPF same as Graham flour? I am surprised cos I have used both of them and find a difference in their texture and taste. As basic as Waffles. Have made them with just graham and just wwpf and they come out different. From what I have been thinking Graham flour has both the bran and endosperm while WWPF, I think has just the endosperm (or is it just bran?!). WWPF, to me, is much ‘lighter’ than Graham. Like out Indian atta. But try making our rotis with Graham and it will come out coarser and denser. I think some brands sell their WWPF under Graham name…but I have seen them both as separate brands and with distinct textures. 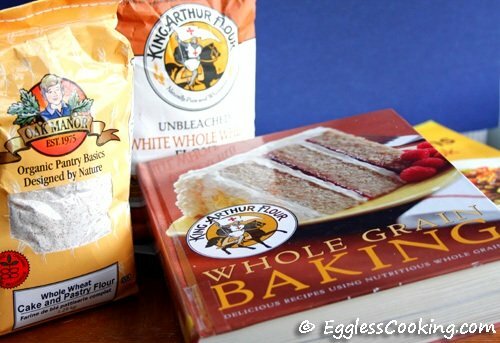 But interesting – Have to investigate more on this..
Hi DK, that’s how King Arthur Flour has it. I have not seen graham flour separately. After reading your comment I did Google and see that some tell it’s the same and like you have mentioned they are sold as two different products too. But I’m very confident about whole wheat pastry flour though. It’s not just the endosperm or bran. It’s whole wheat milled into flour, but like I have written it’s not regular hard wheat. Soft wheat is used to make whole wheat pastry flour. Bisquick is one of the many brands of all-purpose baking mix. This is usually a blend of all-purpose flour, vegetable shortening/vegetable and or seed oils, baking soda, salt and other preservatives. It is used to make biscuits, muffins, pancakes, pie crusts etc.